Your recommendation for motors indicate that it doesn't need much. I first tried an electric and was immediately disappointed. So I bought a new 3.5 Nissan. 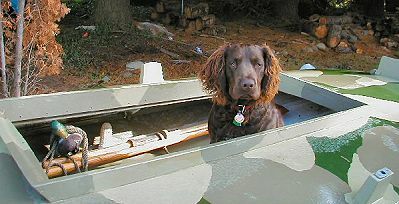 It is a nice motor and pushes the boat about 6 to 7 mph when loaded with decoys, dog, gun, camo-covers etc. I now wish I had pushed my credit limit another $400 and gone for a 5 hp. I think that I could now use that reserve power for when tide, chop and wind are against me. I think the 3.5 is too small for comfort. All in all I am happy with the boat. I will try to find ways to build my next one lighter, since I think it is coming in heavier than the described 120 lbs, which makes launching off roadsides and shoreline banks difficult.